Lesley and Kelvin Christiane have been running Twickenham Jazz Club for ten years. As part of their tenth anniversary celebrations, Lesley has kindly written this entertaining, instructive piece for us about their work as indefatigable promoters at the heart of the London scene: Here, from the people who know, are "The Joys and the Delights of Running a Local Jazz Club:"
New Year, New Venue and wonderful things are happening at Twickenham's long-running Jazz Club which now has a new home The Famous Cabbage Patch in London Road Twickenham in Patchworks night club. 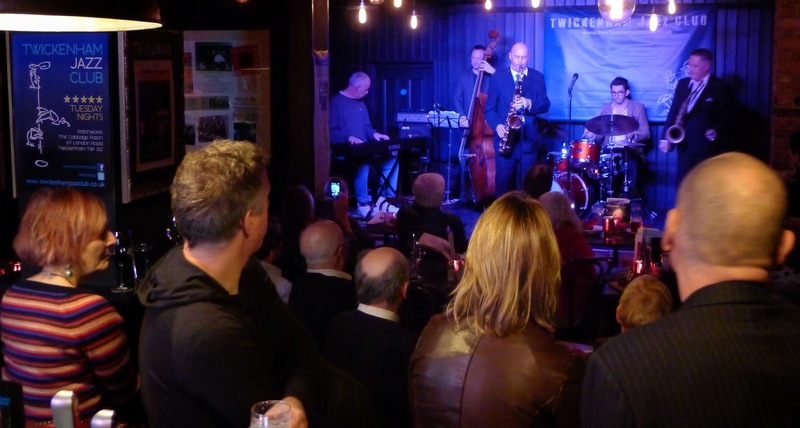 Twickenham Jazz Club has had a rocky old road since we originally conceived the idea of it over ten years ago. We simply wanted to put on some great gigs in our own home town to avoid the journey to central London. The original venue ' The Red Lion' Twickenham, is now a Tesco mini store, another venue a pizzeria and so it goes on, but running local Jazz Clubs can be like that. You have to be dedicated, open hearted, enthusiastic and flexible. To this day and completely against the odds the club presents great music and maintains a very committed jazz following. The latest venue is inspired with a new purpose built music room. a pub that has a positive attitude to music that gives the couple creative scope to again push the frontiers of Jazz. So what are the secrets of our success and this longevity? 1) " We try to present a truly varied programme. Jazz preferences are as broad as the genre itself and not everyone will like it all, but the element of surprise is integral to capturing new and different audiences"
2) "We are always hospitable and welcome everyone and have fun..so many small clubs are unfriendly and look on newcomers with suspicion..it is so important to be inclusive and create a good atmosphere and be prepared to share your table !" 3) We always vary the rhythm section to suit different musicians. unfortunately some clubs don't do this and it can all get a little stale and very hard for the guest artist to perform at their best. Jazz is mercurial and wants to change shape and wander to where it wants to..its hard if it is stuck in a thermometer. 4) For us. glamour is legitimate..dressing up is such fun and everyone wants to really. 5) We try to really look after our musicians.and never forget that making Jazz is a complex and demanding business, and they have dedicated their life to perfecting their art.so we try to take care of them..because apart from the fact that many of them are our friends.if they feel happy in our venue, they play their very best and everyone benefits. 6) We don't take any of it too seriously ..not really .....! The monthly programme always includes a Big Band Session with the in house Kelvin Christiane All Star Big Band. The Band Session which may include quartets, quintets. even sextets of original musicians with music that ranges from the mainstream American Songbook, to self-penned original music on the cutting edge of modern Jazz. The vocal session which is intimate and almost acoustic featuring our finest vocalists in a trio format, and there are ambitions to create a showcase night to present the new rising stars of Jazz..
Twickenham Jazz Club @ The Cabbage Patch. 67 London Road, TW1 3SZ. Rousing night with the full Big Band sound, trumpets, trombones, saxophones, clarinets and full rhythm section featuring some of the finest names on the Jazz circuit and music from the roaring 40s to the present day. with Martin Shaw, trumpet, Nick Mill's,trombone, Leon Greening, piano, Jez Brown, double bass, Kelvin Christiane saxophone Matt Home, drums. Great all star sextet who's Jazz mantra is to keep the great music of the 60's Bluenote Era alive It Features the sounds of Art Blakeys Jazz Messengers, Wayne Shorter, Freddie Hubbard, Joe Henderson & Lee Morgan. The sextet performs all over the UK and Europe at festivals and clubs including guests such as legendary US Saxophonist Dave Liebman. An intimate, mellow almost acoustic session with this wonderful jazz vocalist and guitarist and gifted jazz legend Jim Mullen.